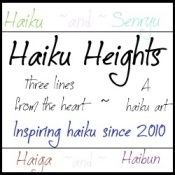 This week's prompt for Haiku Heights is True. Sharing some true feelings. P. S. : Some important posts are delayed due to unexpected situations around. I am trying to back with the same zest soon...:). Her buckets emptied,yet so full!